Every marriage goes through rough waters. It is important that couples work on strengthening their relationships on a regular basis. Marriage counseling exercises can help couples facing a difficult time and can also help partners who want to work on maintaining a healthy marriage. Miscommunication is a common problem in many marriages. Partners often misinterpret or make assumptions about what the other person is saying. A good communication exercise to help those in a relationship understand their differences in perception is using "you said" and "I heard" statements. In this exercise, partners take turns repeating the other person's statement and explaining their own interpretation of the message. Showing appreciation is a quality that is often lost as the years go by in a marriage. Appreciation triggers the happy neurons in the limbic system and brings partners closer together, explains Jon Meyerson, LCSW, in the article "Success With Couples Therapy -- A Step-by-Step Approach," published in "Social Work Today." This exercise allows partners to show that they respect and prioritize one another. In this activity, partners sit facing each other. One person starts by vocalizing appreciated qualities about the other person. The other person then mirrors this appreciation by also making a statement. This is repeated until time is over. It is recommended to set a timer for 10 to 15 minutes for this exercise. 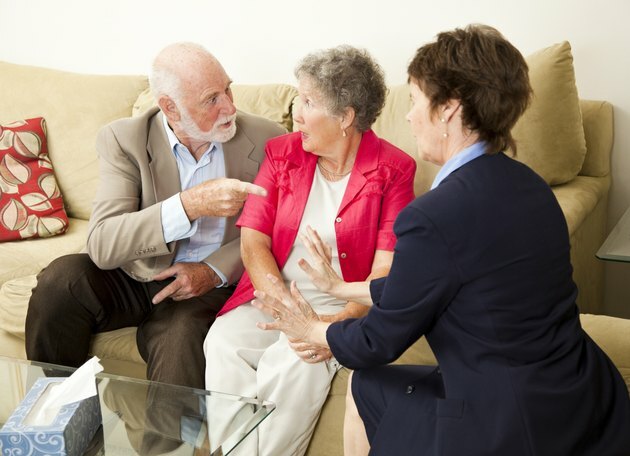 Name calling, blaming and criticism are extremely damaging to a marriage. In the article "Couples at Risk & the Four Horsemen," published on her website, marriage counselor and certified Gottman therapist Lisa Lund recommends making direct complaints that are not global attacks on a partner's personality. In this exercise, partners are asked to focus on attacking the other partner's behavior rather than the person by avoiding statements that start with "you." Instead, they are asked to make statements that specify the behavior that bothers them, stating the reasons why and suggesting acceptable behaviors. Partners often become so used to making sacrifices in a marriage that they forget to express their wants and needs. In this exercise, partners can share their expectations and desires regarding the relationship. Each person is asked to fold a paper in four and label each square with the following categories: emotional, material, physical and social. They will then fill out each square with four to five needs or wants that they have in each of the four categories. After they have finished, partners exchange their papers and have a discussion about these needs.